Most pet owners assume they would know if their pets were in pain. But most people don’t actually know the signs of discomfort in animals. And the other tricky thing is that dogs and cats tend to hide their pain. They are “wired” to do so because out in the wild, if they show weakness, they could be targeted as an easy kill by a predator. As a result, a large percentage of pets that experience chronic pain, don’t receive the treatment they need. In celebration of APAM, we at PetCure Oncology are spreading the word about unrecognized pain in pets. We’d like to educate pet owners about the signs and symptoms, and when to seek treatment — so that our furry friends are not living in distress. The first step is recognition — knowing the signs. Changes in their behavior are the main indicators of pain in both cats and dogs. Changes in behavior also tell us about improvement or progression. Reluctance to move around or socialize. One of the most common indications of pain in a cat is a change in litterbox usage. If your cat suddenly begins going to the bathroom outside of their litterbox, they may be suffering from discomfort that stepping into a litterbox causes or makes worse. Dogs will also “go” where they are not supposed to when in pain, even if they are completely housetrained. While it can be a little easier to identify a dog in pain than a cat, many pets try to put on a strong face for their humans. They may try to hide limps, and so on. So, with both cats and dogs, it is important to be attentive to very subtle changes. 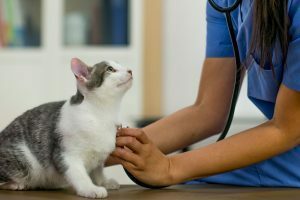 Often, pet parents will bring pets to the veterinarian when there is an acute (sudden) episode of obvious pain or when they see a swift behavior change. 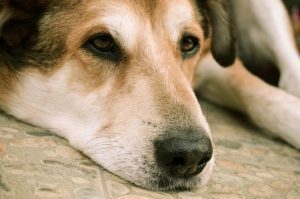 Chronic (ongoing) pain from issues such as joint problems can be harder to recognize because they can occur slowly over time, creating the appearance a pet is just “growing old” or uninterested – when they are actually in pain. Degenerative joint disease is one of the most significant and under-diagnosed diseases in cats and dogs — and is found in pets of all ages. It worsens over time, but the wonderful news is that there are options for pain management. The bottom line is that any change in your pet’s behavior (no matter what behavior) should arouse your suspicions. If you see any of the changes mentioned above or you suspect pain, do not ignore it. Make an appointment with your veterinarian as soon as possible. Signs of pain should be evaluated early. Sometimes a behavior change is not straightforward and is indicative of something more serious. For instance, a limp could be more than a sprain or strain — it can actually be a consequence of cancer. The sooner you catch it, the more treatable it is. At PetCure Oncology, we are here for you. We treat pet cancer with advanced technology, veterinary cancer specialists, and true compassion. Veterinarians are busy. They don’t always carry out a pain exam during a physical exam. It is up to you — the pet parent — to keep your eyes open for the signs of pain, to notice subtle changes, and to seek treatment. Prompt pain treatment means your pet family member feels better sooner and will hopefully be back to their old behaviors and personality. Fortunately, for age related pain, there is an array of medicine, complementary therapies, rehabilitation and more to help ease the transition from middle age to senior to geriatric pet. Age is not a disease, and the typical signs and symptoms of age progression can be minimized for a better quality of life. Your pet will thank you! An important note: Please know that pain medications for humans should NEVER be given to pets. Their systems are very different from ours and they process medicines differently. Something that may dull pain in humans may be sickening or deadly to animals.